Mah Jong has not been around for as often as many people think it has, although older versions of the game may have been in existence in different form (such as cards) for many decades. The game of Mah Jong began in China, and there is some debate as to when it exactly began, where, and by whom. There are different variations of the spelling of Mah Jong in English, and it is sometimes referred to as all one word – Mahjong. Either way, Mahjong, or Mah Jong, is usually considered correct. However it began, it was being played in China in the mid to late 1800s, and was brought over to the United States in the 1920s. Yet another theory places its origins during the Taiping Rebellion and its creators as Chinese officers during that time. Interestingly, the game was completely banned in China by the regime in 1949. The People's Republic of China declared it to be outlawed, along with other gambling activities. Mah Jong and other games like it were considered by those in power to be a representation of capitalist corruption, and they were having none of it. It was not until the Cultural Revolution that the game was brought back into play minus the gambling element and people started to play it openly again. Finally, in 1985, it became legal again to play, and people in China and other Chinese communities began to play it in earnest again. Although an American anthropologist by the name of Stewart Cullen wrote a paper mentioning the game of Mah Jong in 1895, it was not fully introduced into American culture until the 1920s. The company Abercrombie & Fitch was the first company to sell Mah Jong sets. It became such a resounding success in New York that one of the co-founders of the company, Ezra Fitch, decided it would be a good idea to dispatch a number of emissaries to cities in China to buy up all the Mah Jong sets they could find. In their years of production, Abercrombie & Fitch ended up selling around 12,000 sets of Mah Jong. At the same time, in the year 1920, another man was helping to increase the popularity of Mah Jong. Joseph Park Babcock published a book that laid out the rules of the game. This book, also commonly referred to as the "Red Book", was called Rules of Mahjong. Babcock, who had learned how to play Mah Jong in China, took the rules of Mah Jong and made them a bit simpler and more streamlined to make things easier for Americans who would play the game. His version of the rules was much less complicated, and whether this was the reason or not, Mah Jong enjoyed fad status around the 1920s as many people in the United States began to play it. After the fad ended, a large portion of the rules he devised were discarded, and people went back to following the original rules of the game. Mah Jong became known by many different appellations, such as the wordy "Game of a Thousand Intelligences" and "Pung Chow". 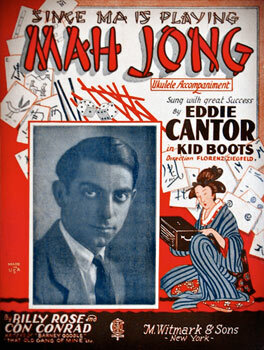 It would find its way into popular culture at the time, with a song even being produced called "Since Ma is Playing Mah Jong", which was recorded by singer Eddie Cantor. In 1937, the game of Mah Jong became much more regulated with the formation of the National Mah Jong League, also referred to as the NMJL. The League was the first to devise an American rule book, which was entitled "Maajh: The American Version of the Ancient Chinese Game". 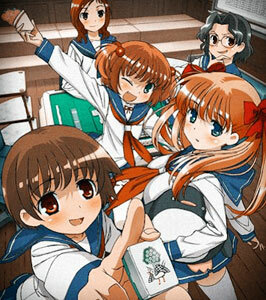 'Ritz Kobayashi's Saki high school mahjong. During the early years of its release and play in the United States, culturally it became a game that was often and mostly played by Jewish women. In fact, the founders of the National Mah Jong League were all Jewish women. They played it as a fun and challenging game that was part of their social life, and there was no gambling involved with its play, which is different from in China where gambling was coming with the play of Mah Jong. It was these Jewish women who are responsible for the most popular form of Mah Jong played today, which is referred to as "American Mah Jong". Today, there are actually now two Mah Jong organizations in the United States. The National Mah Jong League has been joined by the American Mah Jong Association. This association has put on Mah Jong tournaments all over North America. They are perhaps most famous for their signature tournament, which is held at the prestigious Trump Taj Mahal Casino Resort which is located in Atlantic City, New Jersey. The NMJL, who conducted their first Mah Jong cruise tournament in 1986, is also known for their hosting of the 25th Silver Anniversary Cruise in 2010, where players came from Canada and every part of the U.S. to compete. Today, Mah Jong is more popular than ever, spanning the globe. Although it continues to have a greater level of recognition and popularity in Asia, it is continuing to grow and become a part of American game playing year after year. One of the reasons for its continued popularity with regard to popular culture are the numerous references made to it in anime and manga, as well as its increasing success as a computer game. With the advent of computerized Mah Jong games, the game has successfully moved into the 21st century.